Lycium barbarum.Merel R. Black.Robert W. Freckmann Herbarium.University of Wisconsin at Stevens Point.wisplants.uwsp.edu (Accessed 9/2014).Lycium barbarum.Merel R. Black.Robert W. Freckmann Herbarium.University of Wisconsin at Stevens Point.wisplants.uwsp.edu (Accessed 9/2014). Lycium barbarum is a woody vine, often shrub-like, to 6 m long, often prostrate, stems slender, young stems irregularly ribbed, arching or sprawling, nodes often with a short thorn above the main leaf scar, bark pale gray-yellow. Leaves alternate, but in tight rosettes on flowering branches, lance-shaped to egg-shaped, to 7cm long, 3.5 cm wide, much smaller in inflorescence, bright green, smooth, tip pointed to blunt, base narrowed to short stalk, semi-evergreen, remaining green into late fall or through winter. 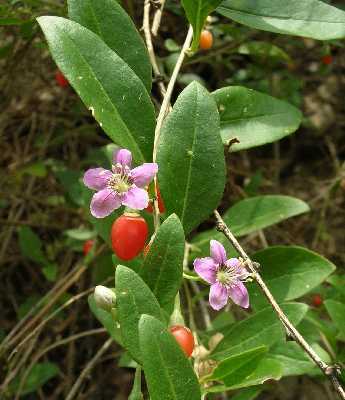 Flowers purple-white, to 1.4 cm long, tubular, 4-5 parted; flowers in small clusters of 1-4 at nodes along branches, July-Sept.
Fruit fleshy, bright red to 2.5 cm long, egg-shaped (Rehder 1986). Habitat: Escaped from cultivation or from garden waste, found in part-shade, upland disturbed edge.